Devdan - Treasure of the Archipelago is a show which includes the modern and contemporary acrobatic dance performance which is inspired by the culture of Indonesia. This traditional performance takes you through a mesmerizing tour of Indonesian history stating from Bali and then going on to Sumatra, Java, Borneo and Papua. With special effects and backdrop, Devdan show is quite entertaining affair! Online ticket bookings are available. Various restaurants and cafes are available. Reservation for the show can be made 3 months in advance. Given ticket price is for adult basic ticket. For children: 50% off from publish rate (on basic tickets). For other ticket details, check the official website. Group booking of (3 – 5 people) have discount rates. The show starts at 7:30pm. Duration of the show: 90minutes. The show doesn’t take place on Tuesdays, Thursdays and Sundays. How popular is Devdan Show? People normally club together Gunung Kawi and West Bali National Park while planning their visit to Devdan Show. This was a very well-done show! We enjoyed it and the dancers were very skilled. We had VIP seats, which were in the center of the theater (not in front, a surprise to us) but were big leather recliners, plus we got to go onstage after the show to meet a few of the dancers. The show was about 90 minutes. Warning for parents of little kids: there is one scene that simulates a death, and our 3-year-old was scared. But overall it was a lot of fun and I would recommend it. A well directed show which offers wide variety of Balinese culture and religions. It consist of Christian, Muslim, Buddhist, and Hinduism. Some nice effects of light, water, and fire added to show. Amphitheater itself is nice and modern in luxurious part of Nusa Dua. This was my first time watching the show and I got to say, this was perfect. Spent around 2 hours watching and the story really was the best. The lighting, the stage, the artists. There were so many details I would like to applaud. There are some parts of the story that might be missing in terms of numbers of dancers or characters but I believe the directors did well arranging all of the parts. You pay amount of 300k to 1 million idr I believe depending on your seat. The more you pay, the better your seat going to be. Overall, worth the money. The show isn't daily show. It's around 3 times a week so you might need to check their schedule to book. The Devdan show is highly recommended. 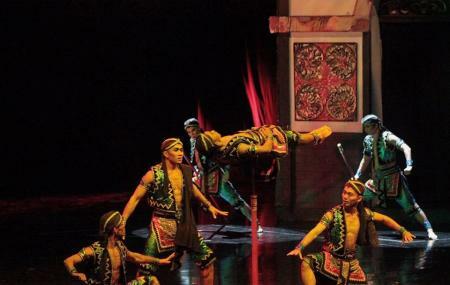 The show combines dancing, singing, aerial acrobatics, lighting and special effects to display some of the history, customs and culture of the Indonesian people. The theatre is a beautiful venue. It is wheelchair accessible and air-conditioned, which was a welcome relief from the Bali tropical. The show runs about an hour and a half and the tour included transportation to and from the event. Flash photography and video taping is prohibited during the show. Pictures may be taken when the cast makes their final appearance. Make sure to print vouchers in advance and contact tour company 24-48 hours in advance to confirm transportation details. Upon arrival, redeem voucher at theatre box office for tickets to the show and obtain a return transportation card. The theatre is located next to the Bali Nusa Dua shopping center, an open-air mall that contains several shops, restaurants, money changer (currency exchange), ATM, convenience store and other businesses. Unfortunately, we did not have a lot of time to tour the mall prior to the show but were able to purchase some inexpensive souvenirs at the Coco Mart.The theatre opens at 7:15 pm and the show ended at 9:00 pm. Theatre staff take souvenir photos prior to show that can be reviewed and purchased after the show. The price for two photos in a Devdan Show binder was 220,000 rupiah (15.11 USD). The show was very enjoyable and we would see it again if we travel back to Bali.